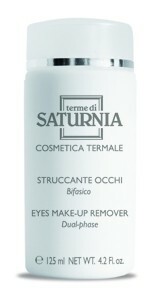 Make-up remover designed for the eye contours with an exclusive bi-phase formula.¾ Suitable for all types of skin. Make-up remover designed for the eye contours with an exclusive bi-phase formula.¾ Suitable for all types of skin. A gentle, refreshing, soothing and decongesting treatment for the eye contour area. Shake before use to mix the two phases.¾ Apply on a cotton pad and glide over lids and lashes.¾ Repeat if necessary until complete removal of make-up.